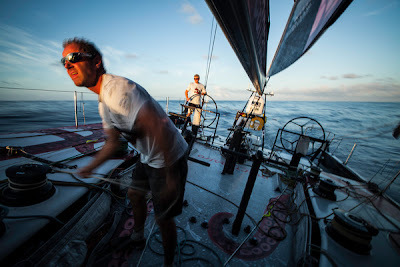 CAMPER with Emirates Team New Zealand (Chris Nicholson/AUS) continue to maintain the lead in Leg 6 to Miami from their inshore position, 20 nautical miles off the Brazilian coast, but the fleet is clearly divided on whether sailing inshore or offshore will pay off. 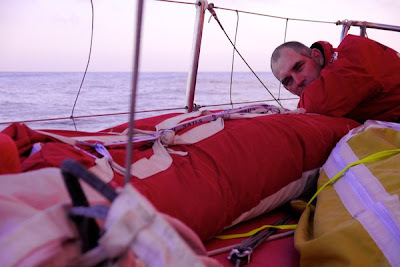 Although CAMPER is carefully rock hopping up the coast, avoiding the Brazilian current and with Abu Dhabi Ocean Racing (Ian Walker/GBR) for company, skipper Chris Nicholson would have preferred to be in closer contact with the rest of the fleet. “You’d always prefer to keep your enemies close, but we had a bit of trouble hanging onto them on the tight reaching and, at the end of the day, that option wasn’t there for us,” he explained. Instead, the inshore duo will have to wait another 48 hours or so before the outcome of their decision becomes clear. 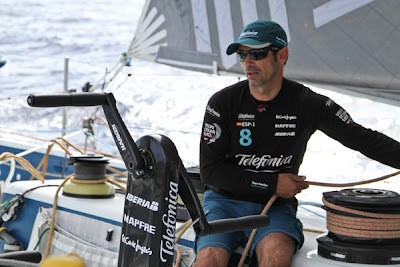 For the pair furthest offshore, Team Telefónica (Iker Martínez/ESP) and Groupama sailing team (Franck Cammas), currently in fourth and fifth places on this leg, but in first and second overall, the last 24 hours has been spent dawdling in fickle breeze. 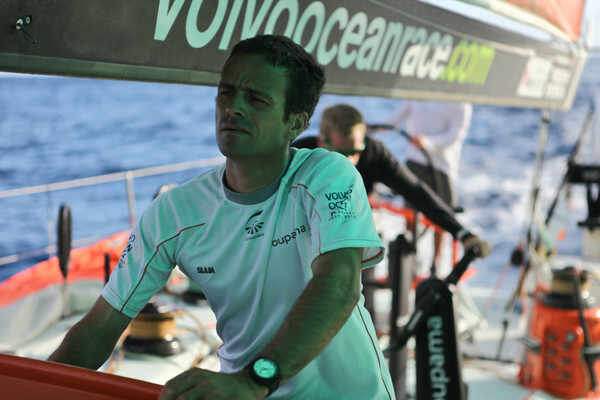 Groupama skipper Franck Cammas is happy to be offshore, viewing the inshore option taken by Ian Walker and Chris Nicholson as risky. 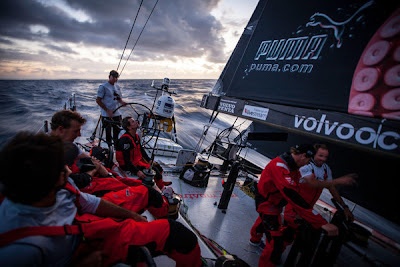 It has been a tough day for PUMA, as both groups started to move again, the team were parked under a big cloud, which extended as far as the eye could see. 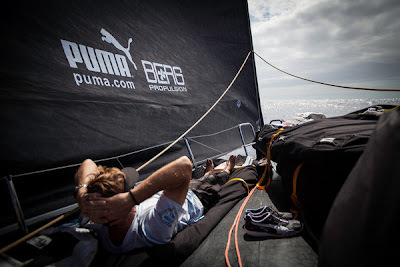 “There is no pretty way of getting round this corner at the moment,” said PUMA navigator Tom Addis, as the fleet drifted in hot sun and crystal clear water. With the south east trade winds still a tantalising 48 hours or so away, the immediate concern is dealing with the instability of the transition zone. 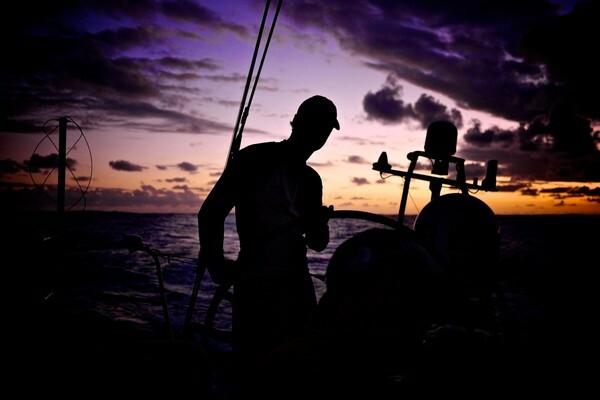 At 1900 tonight CAMPER led the fleet from Abu Dhabi Ocean Racing by 2.7 nm with Groupama in fifth place, 41.30 nm astern. The fleet now has a lateral separation of a whisker under 100 nm, which can easily produce different breezes and different currents. During the past three hours, boat speeds have climbed back up to a promising 13.3 knots for PUMA, but it is a game of patience once again.